just drag the material into the Project Manager from the Material Editor or Slate Material Editor. 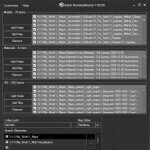 The code of Asset Tracking system has been rewritten and using the Project Manager you can be sure that you have a complete control over external links into your scenes. It is definitely that any of the available similar plugin doesn’t support the same number of asset types as the Project Manager. For example, any from similar plug-ins can’t display and relink the Vray Lens effect with the missing bitmap. Fixed issues with relinking Maxwell objects that use external links. 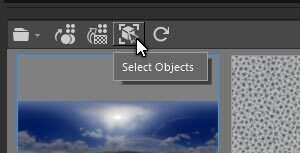 Selecting objects by dependents assets are work more quickly. now you will have access to particular links that are invisible for standard Asset Tracking. Added the ability to strip paths. 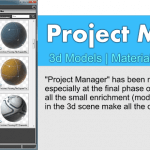 This version of Project Manager is compatible with the new version of 3Ds Max 2018. Added the support to Arnold and RedShift renderers – now you can create Proxy, IES and materials what are compatible to these renderers. A new ability of rendering models using all cameras which present in the scene. **Saving materials to library by dragging from Material Editor: this ability available for 3Ds Max 2014 and above. Related to "Project Manager version 2.70.25"